From the spacious landscape gardens to the splendid homes & clubhouse, you are spoilt for choice. 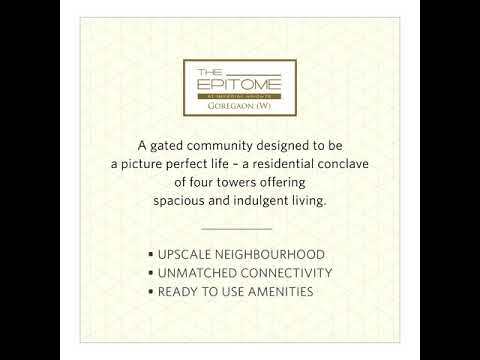 With 'The Epitome' (Tower C & D), one of the finest residential projects in Goregaon West, we have spun every single piece of this new residential tower into a lavish experience. If it is space you are looking for, this is it. If it is classy neighbours, then this is it. If it's about being well connected, this is it. An apt mix of solitude and accessibility, this project is a residential dream come true. Set in the backdrop of a no construction zone, the tower boasts of an obstructed view of the skyline with the glistening sun spreading its natural light brightening every corner of your apartment. Welcome to 'The Epitome', this is as good as it gets. 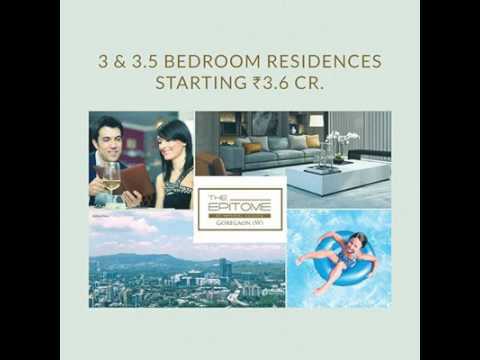 3 BHK, 3.5 BHK, 4 BHK apartments in Goregaon West. 44-Storey towers with a 4-Level podium car park. The only thing better than coffee is coffee with friends. Enjoy it as per your taste, it’s bound to add sweetness to your life. Every step you take here, brisk or relaxed, you will only go forward. Run towards your goals and when you achieve them, run some more. A fit body complements a healthy mind. Fitness is right at your door step. Enjoy the smart equipment at the gymnasium to keep yourself fit and fine. Dive into the lap of luxury. Drench your body and cleanse the mind. The sprawling pool at 'The Epitome' is a true aquatic escape from the daily routine. Go ahead, have a blast! A pool dedicated exclusively for your little ones. Whether they want to spend a leisurely afternoon or make a splash ‘this is it’. Grab some well-deserved minutes of quietude at the library. Unwinding with a good book is always therapeutic. Tranquillity, rejuvenation, serenity, luxury, energizing are just a few words to describe the spa experience you will find at 'The Epitome'. Enjoy a spa getaway within the serenity of your own premises and fulfil your need to indulge! Celebrate the best moments of life amidst loved ones at our multipurpose hall. With spaces as big as your heart, it has enough room to host your friends, family and all the memories you make with them.